TH E M R EP O RT | 5 MTECH folding and mailing appraisals to borrowers." According to Global DMS, the CFPB issued its Disclosure and Delivery Requirements for Copies of Appraisals and Other Written Valuations under the Equal Credit Opportunity Act (Regulation B) rule, and the copies of valuations may be delivered to the borrower either on paper or electronically. The announcement said that although some solutions handle electronic delivery of appraisals, Global Delivery sufficiently ad - dresses the hard-copy delivery of appraisals or other valuations to the borrower via mail. 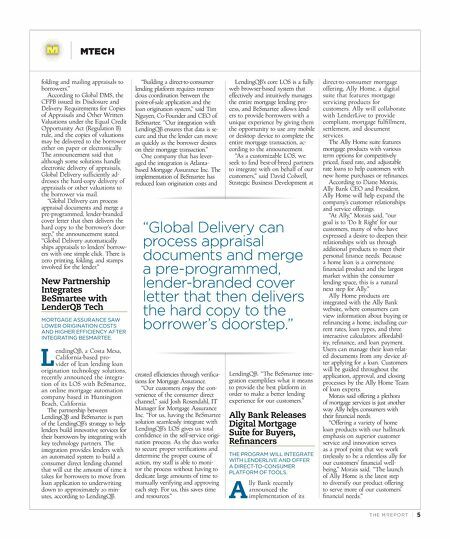 "Global Delivery can process appraisal documents and merge a pre-programmed, lender-branded cover letter that then delivers the hard copy to the borrower's door - step," the announcement stated. 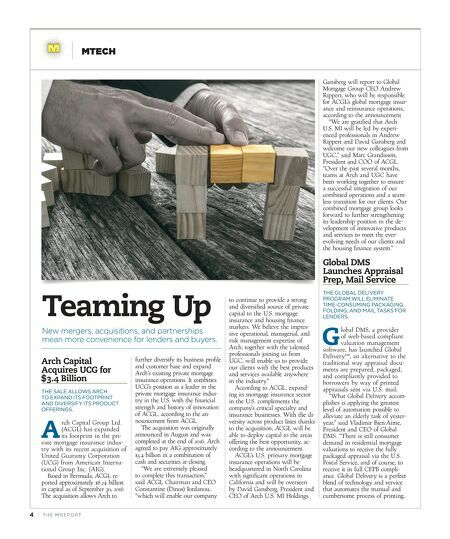 "Global Delivery automatically ships appraisals to lenders' borrow- ers with one simple click. There is zero printing, folding, and stamps involved for the lender." New Partnership Integrates BeSmartee with LenderQB Tech MORTGAGE ASSURANCE SAW LOWER ORIGINATION COSTS AND HIGHER EFFICIENCY AFTER INTEGRATING BESMARTEE. L endingQB, a Costa Mesa, California-based pro- vider of lean lending loan origination technology solutions, recently announced the integra- tion of its LOS with BeSmartee, an online mortgage automation company based in Huntington Beach, California. The partnership between LendingQB and BeSmartee is part of the LendingQB's strategy to help lenders build innovative services for their borrowers by integrating with key technology partners. The integration provides lenders with an automated system to build a consumer direct lending channel that will cut the amount of time it takes for borrowers to move from loan application to underwriting down to approximately 20 min - utes, according to LendingQB. "Building a direct-to-consumer lending platform requires tremen- dous coordination between the point-of-sale application and the loan origination system," said Tim Nguyen, Co-Founder and CEO of BeSmartee. "Our integration with LendingQB ensures that data is se - cure and that the lender can move as quickly as the borrower desires on their mortgage transaction." One company that has lever- aged the integration is Atlanta- based Mortgage Assurance Inc. The implementation of BeSmartee has reduced loan origination costs and created efficiencies through verifica- tions for Mortgage Assurance. "Our customers enjoy the con- venience of the consumer direct channel," said Josh Rosendahl, IT Manager for Mortgage Assurance Inc. "For us, having the BeSmartee solution seamlessly integrate with LendingQB's LOS gives us total confidence in the self-service origi - nation process. As the duo works to secure proper verifications and determine the proper course of action, my staff is able to moni- tor the process without having to dedicate large amounts of time to manually verifying and approving each step. For us, this saves time and resources." LendingQB's core LOS is a fully web browser-based system that effectively and intuitively manages the entire mortgage lending pro- cess, and BeSmartee allows lend- ers to provide borrowers with a unique experience by giving them the opportunity to use any mobile or desktop device to complete the entire mortgage transaction, ac- cording to the announcement. "As a customizable LOS, we seek to find best-of-breed partners to integrate with on behalf of our customers," said David Colwell, Strategic Business Development at LendingQB. "The BeSmartee inte- gration exemplifies what it means to provide the best platform in order to make a better lending experience for our customers." Ally Bank Releases Digital Mortgage Suite for Buyers, Refinancers THE PROGRAM WILL INTEGRATE WITH LENDERLIVE AND OFFER A DIRECT-TO-CONSUMER PLATFORM OF TOOLS. A lly Bank recently announced the implementation of its direct-to-consumer mortgage offering, Ally Home, a digital suite that features mortgage servicing products for customers. Ally will collaborate with LenderLive to provide compliant, mortgage fulfillment, settlement, and document services. The Ally Home suite features mortgage products with various term options for competitively priced, fixed rate, and adjustable rate loans to help customers with new home purchases or refinances. According to Diane Morais, Ally Bank CEO and President, Ally Home will help expand the company's customer relationships and service offerings. "At Ally," Morais said, "our goal is to 'Do It Right' for our customers, many of who have expressed a desire to deepen their relationships with us through additional products to meet their personal finance needs. Because a home loan is a cornerstone financial product and the largest market within the consumer lending space, this is a natural next step for Ally." Ally Home products are integrated with the Ally Bank website, where consumers can view information about buying or refinancing a home, including cur - rent rates, loan types, and three interactive calculators: affordabil- ity, refinance, and loan payment. Users can manage their loan-relat- ed documents from any device af- ter applying for a loan. Customers will be guided throughout the application, approval, and closing processes by the Ally Home Team of loan experts. Morais said offering a plethora of mortgage services is just another way Ally helps consumers with their financial needs. "Offering a variety of home loan products with our hallmark emphasis on superior customer service and innovation serves as a proof point that we work tirelessly to be a relentless ally for our customers' financial well- being," Morais said. "The launch of Ally Home is the latest step to diversify our product offering to serve more of our customers' financial needs." "Global Delivery can process appraisal documents and merge a pre-programmed, lender-branded cover letter that then delivers the hard copy to the borrower's doorstep."